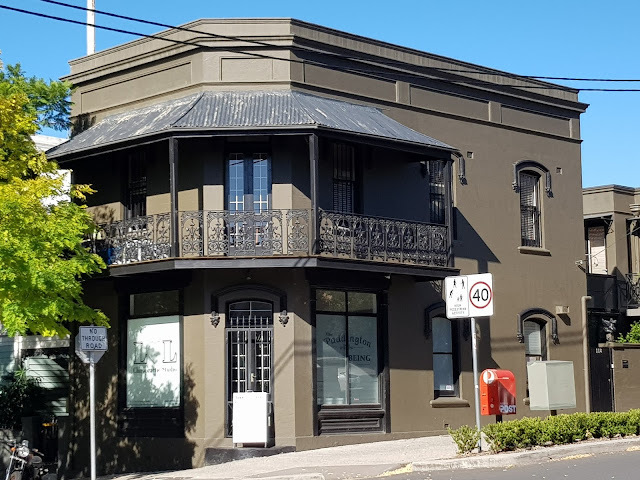 This former corner shop is located on the corner of Elizabeth Street and Sutherland Street, in the inner eastern suburb of Paddington. It is now a wellbeing centre. Similar to the corner shop located on the corner of Elizabeth Street and Hargrave Sts in Paddington, but not as finely renovated. The balcony draws my eye. A nice looking building, the balcony adds its charm to it. looks wonderful . . . thank you. I love it! That balcony calls my name to come sit and watch the world go by! A pretty place, the owners have a gem on their hands. I like the shape of the building front, the railing, and (my favorite) the porch it encloses.